The more I visit unexplored, lesser known places in India, the more I get excited, proud and determined to travel more and more I could and explore the hidden gems of India. Gandikota, I am not very sure, how many of you have heard about this place before. I heard about this place last year from one of my friend, who is from Andhra Pradesh and showed me some images, 12th century fort overlooking a gorge. I was stunned to see those images and this place was in my bucket list for long time. Thought of exploring this place last year but somehow plan didnot work. But as usual, if something is in my bucket list, then its not going to take more time. This time I got opportunity to visit the place with members of Team Pentacle. It was weekend outing, 3 cars and 11 members, we all started at Friday night. There are actually three routes to reach Gandikota, we took shortest, 281 km. Road condition was mostly excellent, first 100 km NH7 Bangalore-Hyderabad highway and then next 100 km was Hindpur-Kadari state highway. After Muddanur town, next 40 km road to Gandikota is isolated and passes through barren land. Uneventful Friday night journey and we reached Gandikota early morning. There is only one option to stay, APTDC resort, Haritha. We booked 4 AC cottages in advance. 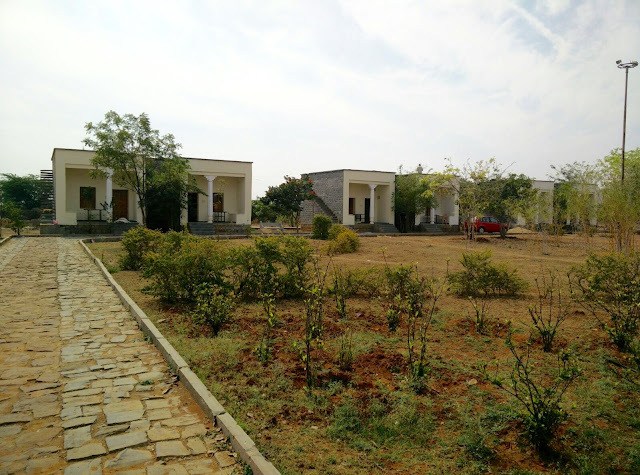 Considering Gandikota is at remote place and no more facilities around, Resort is good and offer comfort stay. Its big complex, plenty of space for car parking, child play area, restaurant, cottages, entire resort is themed like a fort. 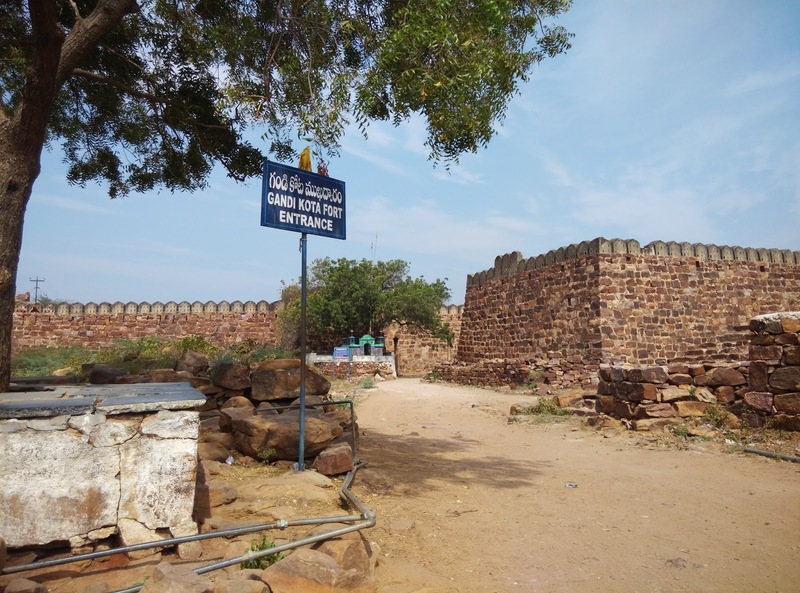 Gandikota small village on the right bank of the river Penna was founded in 1123 by Kapa Raja, the Western Chalukyan king of Kalyana.The town played a significant role during the Kakatiya, Vijayanagara and Qutub Shahi periods. The fort was made more secure and solid by Pemmasani Thimma Nayudu. The fort of Gandikota acquired its name due to the 'gorge' (in Telugu it is called 'gandi'), formed between the Erramala range of hills, also known as Gandikota hills and the river Pennar that flows at its foot, reducing its width to a mere 300 ft. Inside the Gandikota fort, small village is situated. All the attractions are inside the fort and walkable distance. Starting from charminar, you can see Jama Masjid and Temples. The major attraction is Gorge View Point, Once you reach here and see it, you will realize why its getting compared with Grand Canyon. Surrounded by a deep valley, impassable hills, massive boulders of red granite and the river Pennar that flows below on the west and northern sides. From Jama Masjid, once we started walking towards view point, we did not realise that there is something magnificent stored for us, Once we reached at the very end of the chasm, it was wow feeling and we all said here is something magnificent. The view, surrounding, excellent. Next agenda was trekking. But from where to start?? There will be no guide who can tell you more about this place, you may find some local who can just show you some hiking trail. We were clueless but decided our own way to reach at the top of one of the standing pillar. It was a bit difficult and dangerous too, to climb through rocks. The feeling, excitement to reach there, had no words, well my heart skipped few beats, when reached at the top and started looking around. the wind was strong on the top, bit dangerous as well standing there but all of our faces were glowing with satisfaction to reach at the top. khud hi ko kar ittna buland ki tu himalaya pe chad jaye. Well it was opposite. How the hell I am suppose to climb up, completely tired, hot weather, close to 38'c, another biggest mistake we did during entire trek was we had not kept enough water for us. I still dont remember how did I climb up and reach at the car parking. The moment I reached there the first word from my mouth was...water!!! Anyways, it was tough but worth doing it. I wont mind going back there again and doing the same trek again but with more preparation. I know most of you are amazed to see some the pictures and thinking about such breathtaking place. Some of you might be thinking how didn't you know about this place, well India indeed is full of surprises.